Naked Stables Private Reserve, China. An oasis of eco villas with lush touches to match (think jacuzzi on your terrace), Naked Stables Private Reserve is set on Mt Mogan, China. Just a few hours from Shanghai, this exclusive high-end resort offers a luxurious and natural escape within easy reach of the city. 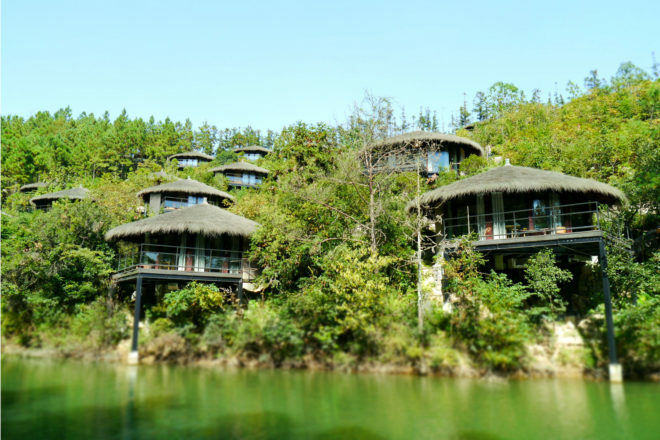 Spread over 24 hectares of fields and thick bamboo forest in China’s Moganshan Valley, Naked Stables Private Reserve has 40 eco-friendly villas and bungalows built from mud, bamboo and reclaimed wood; it is on its way to becoming China’s first LEED certified hotel. The result is an Africa cross Shanghai design with a smart, sleek feel. Think thatched roofs, cowhide rugs, porcelain bathtubs and earth-toned shades with little luxuries like a jacuzzi on the private terrace. Come to breathe in the fresh mountain air and indulge in the great outdoors with the bevy of activities on offer, including horse-riding, hiking, kite flying, archery and an open air theatre showing live music and movies – a far cry from smoggy, congested Shanghai… the air is so clean here it almost sparkles. March to November, during China’s spring to autumn months.